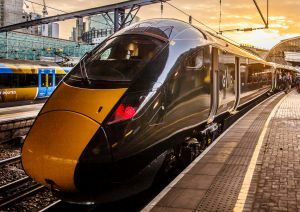 BTN last week was invited to try out the new British-built Hitachi Intercity Express Trains (IETs) that have begun to enter service on selected routes operated by GWR out of Paddington. Network Rail is expected to finish electrification by 2019 of the line between Paddington and Cardiff, which was the route BTN selected. These sleek-looking dark green train units make the existing First Great Western High Speed Trains (HST) look very old. The IETs are electro-diesel units, also known as bi-modes. Once the trains are completed, South Wales customers will experience quicker journey times – up to 21min faster between Swansea and London – plus up to 25% more seats. The IETs specific for Devon and Cornwall are due to enter passenger service later this summer. First Great Western became Great Western Railway (GWR) in September 2015 with a franchise that is due to run until April 2020. The rebranding is still not quite complete. Brunel may have been the greatest engineer of his generation, with railways his speciality, but clearly station design was not one of his strengths. Paddington, the London terminus for GWR (in his time known also as God’s Wonderful Railway), is very practical and works well, but for beauty it does not compare with St Pancras. It is also undergoing a massive rebuild to incorporate the Elizabeth Line, which runs underground beneath what was once Eastbourne Terrace on the west side of the station. In December, the media is expected to be invited to view the new interchange prior to its opening, but one thing is very apparent. A long walk to the departure gate is not just the domain of airports. It is a hike from the Elizabeth Line to the Hammersmith and City platforms. The walk from the Bakerloo Line would seem to be quite a journey too. The good news is the GWR platforms sit between the two local railways. This makes it easy for connecting both ways. The IETs were introduced into passenger service on 16 October last year. 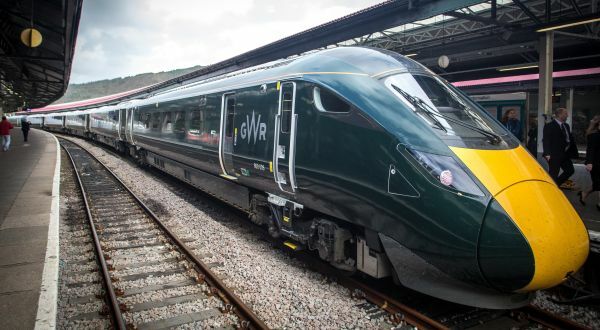 They now operate more than 60 journeys a day on routes between Paddington and South Wales, to Bristol and on the North Cotswolds services, and have already achieved more than 1m miles in passenger service – providing more than 500,000 more seats than the trains they are replacing. The current HST timetable will move to an IET schedule with more services and quicker journeys from early next year when all the fleet have been delivered. GWR offers First, a very comfortable 2+1 with large tables, and Standard, for the most part 2+2. With First, it is difficult to see the changes from the old seats to the new. They follow the basic design except where it comes to the three-pin power point and USB connectors, which are now mounted much more conveniently in the seat frames. However, the leather has been replaced by a non-combustible material to meet the latest safety standards and the air conditioning improved, which together with window frame changes gives a better experience. A large redesigned toilet offers wheelchair accessibility and baby-changing facilities. BTN went outbound IET and returned HST. The new trains are just that little bit smoother and it will be interesting to see how they perform when running regularly at the 140mph design speed. For First Class passengers, a complimentary snacks trolley comes by at regular intervals with porridge available for the early morning services and sandwiches later on. If it's alcoholic beverages you want, those are on sale. The service is rather less than the Virgin Trains full menus, which include breakfast, lunch and evening meal on the trunk routes Monday to Friday. GWR offers the highly-rated Pullman service but on the Cardiff route this comes only as a full “Welsh” breakfast on the 10:45 out of Paddington, or the 06:17 from the Welsh capital, which gets into London just after 08:30. The Pullman starts and finishes further down the line at Swansea. The Pullman is also offered on the service to Plymouth and Penzance. The Standard Class is a breakthrough, with the seats ergonomically designed and with greater legroom and neat pull-down tables. Everyone has electric connections and windows are fitted with blinds. The overhead storage bins are not as large as those on modern aircraft but each coach has luggage racks at the end of the carriage and there is a lockable compartment for stowing luggage and cycles. The First Class lounge at Paddington has been refurbished and there is one at Cardiff as well, both with complimentary tea, coffee, water, cola and juice, plus small snacks of biscuits, cake, crisps and fruit. Trains run from Paddington to Cardiff every 30min from 06:45 and take on average 2hr 15min. The last one is 20:15, although during the night there are slow stopping trains for insomniacs. In the other direction, the 06:15 gets in at 08:32 and it is suggested you book, as it gets very busy. The last fast train is 19:17, arriving 21:31. GWR is now catching up. For the future, there is the new IET Night Riviera Express leaving Paddington just before midnight and arriving in Penzance a few minutes before eight in the morning. In the other direction, she leaves at 21:45 arriving at London at 05:23, but you can stay on board until 07:00, and First Class passengers can take complimentary breakfast in their cabins. There is a selection of stops en-route. The implication that HST seats are made of combustible material is almost certainly incorrect. Two points. Do the windows align well with seats in Standard class? Not always the case in Virgin west coast for example. Second, re the long walks at Paddington to the Elizabeth line, why not moving walk-ways as at Waterloo? I hope the bad experience of interchanging from the Victoria Line to St Pancras main line is not repeated.